Vocational Rehabilitation shares a success story in honor of the American Disabilities Act’s 24th anniversary, tomorrow, July 26. VR, the Division of Blind Services, and other agencies helped another person achieve their entrepreneurial goals. Bobby Talley demonstrates one of the pillars that can ride on water. The next time you’re visiting Avon Park, Florida and are looking for something to do, look no further than Sight Unseen Enterprises for fun games to play both on land and on Lake Verona. (You can ride something called a water pillar – a super-cool looking floating bike with huge wheels that skim across the water.) The new business, owned and operated by local native Bobby Talley, was started so that families could have fun together at the lake. Bobby, who has been blind since having meningitis when he was four years old, received assistance from Vocational Rehabilitation (VR) and the Division of Blind Services, along with other agencies to start his business. VR Counselor Linda Daffner met with Bobby to discuss his career goals. When they decided on self-employment, she brought in Monica Doyle, a Certified Business and Technical Assistant Consultant (CBTAC), to help get his business off the ground. In deciding what type of business would be best for Bobby, they discovered a need for fun, family-oriented activities at Lake Verona. That, along with Bobby’s love of sports and the fact that he could walk to work, made Sight Unseen Enterprises the perfect match for him. Bobby runs the business with help from his partner, Judy McCarter, and friend, Amir Ghassemi. Judy helps with the bookkeeping, and Amir is a volunteer job coach who helps with game and canopy set up and whatever else needs to be done. Neither one is paid, but they both enjoy what they do and who they’re doing it for. The business has run into a few snags along the way because the lake has been closed to swimming a couple of times. The pillars are not allowed to run during those times because their water guns can shoot water 50 feet and can get into a person’s eyes or mouth. But Bobby just won’t quit. 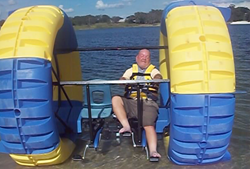 He added games to rent and play on land, and he’s looking to add paddle boats and hydro-bikes, which could be used even if the lake is closed to swimming. He’s also purchased a large movie screen to show movies at the lake. Sight Unseen Enterprises is open year-round, so there’s always something to do. Be sure to stop by Donaldson Park the next time you want to go on a fun, family outing. Just watch out if you ask Bobby to join in a game. He’s a ringer…he not only loves renting out the games, he can play all of them too and play them well.